“Buried by the Times” would be an excellent book if only you didn’t have to read it. The tome, penned by journalism Professor Laurel Leff, is a remarkably thorough and damning expose of how and why the New York Times systematically ignored or gave short shrift to Jewish persecution and the Holocaust in the ’30s and ’40s. While a story about an enraged bull rampaging across Long Island and goring two farm hands reached the Times’ front page, the news of enraged Nazis rampaging across Europe and slaughtering millions of Jews was buried on page 19 amidst the Bloomingdale’s ads. In calling out the Times’ whitewash of the pinnacle of human cruelty, Leff’s book is an absolutely towering home run; her devastating analysis is incontrovertible, as even current Times officials have admitted. Yet, taking in Leff’s argument, a reader can’t help but feel like the presiding judge in the case of People v. Saddam Hussein as the prosecuting attorney unveils exhibit 423-b. Leff has obviously read damn near every word in every New York Times for a two-decade period, and, for better or for worse, it shows. Leff, a former Wall Street Journal reporter who teaches at Northeastern University in Boston, details a Chernobyl-like series of unfortunate events creating the perfect storm to blow the story of the century off the front page. First and foremost was the Times’ Arthur Hays Sulzberger. The paper’s publisher was an ardent – if not fanatical – anti-Zionist who refused to see Judaism as anything more than a religion. He put his foot down when it came to calling for aid to Jews rather than for any and all oppressed peoples. The publisher’s pie-in-the-sky idealism was ideally suited for a disaster during the Holocaust. Yet, Hitler, in persecuting Jews simply because they were Jews, just didn’t fit into Sulzburger’s worldview. The Times’ gravest sin was to systematically and repeatedly water down the Jews’ suffering by tying them in with every other group menaced by the Nazis; the Times even failed to mention the word “Jew” in the paper’s editorials about the Warsaw Ghetto uprising. Sulzberger was a hands-on owner, and he called the tune when it came to not singling out oppression of Jews. What’s more, he was deeply worried that the Times’ credibility would be called into question if the Jewish-owned paper were to be seen as a cheerleader for Jewish interests. The great irony, as pointed out by Leff, is the paper’s Jewish ownership, which so many U.S. Jews (and even members of the government) hoped would make the Times the leader in Holocaust coverage, actually led the paper to shrink away from it. But Sulzberger didn’t bury the Holocaust all by himself. The Times’ European reporters were either disinterested by the plight of the Jews, sympathetic to the Nazi or Vichy governments or, with the best writers covering the battlefield, simply second-rate journalists. The Times also followed the party lines of the American and British governments in the name of the war effort, and these party lines often didn’t give a hoot about the Jews. Jewish suffering was deemed poor propaganda. Finally, Leff argues, Times reporters and editors simply didn’t understand how much Nazis hated Jews. The devotion of much-needed soldiers and resources to liquidating Europe’s Jews simply didn’t make sense. The vastness of Leff’s task is partially to blame for the lengthy and serpentine nature of this book. But, she does get incredibly repetitious and this read is a real slog. Her study is a remarkably complete examination of how ideology, indifference and incompetence mixed to keep America’s paper of record from recording how Jews were singled out for destruction by the Nazis. This book belongs on the shelves of anyone serious about Holocaust scholarship. But, for the vast majority of readers to be able to digest this thicker-than-a-whale-omelet meal, they’ll have to wait for the Cliff’s Notes version. 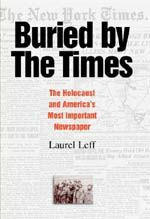 “Buried by the Times: The Holocaust and America’s Most Important Newspaper” by Laurel Leff (426 pages, Cambridge University Press, $29).